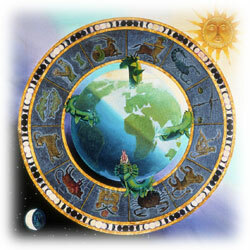 The planets , and constellations, in the sky, are the base on which rests the ancient art and science of astrology. The way they place themselves, the way they move, all has an effect on the earth and all life on earth. There is a strong relation between the happenings that occur on earth, with them. A simple example that gives us an indication of this is the movement of ocean currents in synchronization with the phases of the moon. Our body consists of 75% of water! So not only the moon but also,other planets have an astral effect upon us all, and all life on earth too. There are innumerable galaxies, and ours is just one of them all. There are numerous solar systems. But the one our earth belongs to is what concerns us most. So the Sun at the centre, is the stable factor, with Mercury, Venus, Earth, Mars, Saturn, Jupiter, Neptune, Harshal, and Pluto revolving around it. To put it in simple words, a horoscope is the map of the arrangement in the heavens, of the planets and constellations, on the given day, at the given time, at the given place, of birth. The time, place and day of birth being the three essential factors involved, without which, an accurate horoscope cannot be made. There must not be any confusion as regard these three. When the birth has occurred at night, there is likelihood of confusion. The day of birth starts at 12 midnight . The complete date, consisting of the day, month and year should be mentioned. Accuracy of the horoscope fundamentally depends upon the accurate time of birth. Rather than mentioning a.m or p.m. it is better to mention hours . Eg birth at 2 p.m means birth at 14 hrs.In the United States of America , the time is changed according to seasons. This must be mentioned ,when giving time of birth. Ideally the standard time should be mentioned. We need to know the name of the town, district, and state. If birth has taken place in a village, the most proximate prominent town should be mentioned.